Dr. Unkefer grew up in Florida and received his B.S. degree, with High Honors, from the University of Florida. He went on to obtain his medical degree from the Baylor College of Medicine in Houston, Texas in 1997. From 1997 to 2001 he completed an internship in Internal Medicine and his Dermatology Residency at Shands Hospital at the University of Florida, where he was Chief Dermatology resident. Dr. Unkefer has spoken to community groups, served as a lecturer for pharmaceutical companies, and was also a clinical teacher of dermatology for family practice residents at the University of Tennessee. 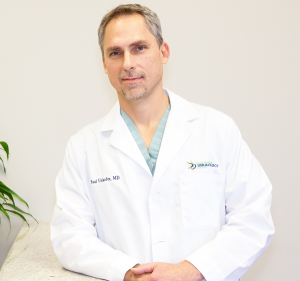 He is a Fellow of the American Academy of Dermatology and the American Society for Mohs Surgery, in addition, he is a member of the East Tennessee Dermatological Society. Dr. Unkefer treats any skin, hair, or nail concerns; possesses extensive training and expertise in the treatment of skin cancer, including performing Mohs micrographic surgery; and offers diverse cosmetic services, including laser treatments, Botox Cosmetic, and dermal fillers. He resides in Maryville, Tennessee with his wife and two children. He enjoys sports and participating in numerous health and fitness activities.